My Mum always said that the way to a mans heart is through his stomach. I'm not sure she was entirely on the money there....hehehe....but food sure figures largely in our lives after 18 years of wedded bliss! One of the Musician Husbands most favourite things, is my Onion Confit. It's a much loved family favourite and we adore it on baguette with soft cheese, with meats and roasts of all kinds, on a Ploughmans platter, with crackers on a cheese board, or with oven roasted salmon. Cooking it is a special guilty pleasure as it scents the house with the most amazing earthy aromas. Buy up onions of any kind when they're cheap and do big batches of this to keep on hand for blokey gifts for husbands, partners, brothers and Dads. They all love it. Mind you, so do the wives, sisters and Mums! You need 4 decent sized (about 250gm) washed and sterilized jars for this amount. Note: you can also prepare this in the slow cooker, by adding 125gms of butter to encourage caramelising, but it does render a slightly softer and not quite as aromatic, result. Given the choice I'd do it on the stovetop. In my older slow cooker, six hours on high and six on low was about right. 1 kg onions. Different onions give a different result. Try red, eschallots, pickling onions or brown ones. Peel and slice the onions thinly. A mandolin slicer will make very quick work of this step. Heat a large frypan over a medium heat and slow cook the onion until it's limp, about 5 minutes. Reduce the heat to very low and simmer, stirring regulary to prevent sticking for one hour. Cover the pan and continue to cook over a very low heat for a minimum of 45 minutes but up to several hours depending upon the depth of flavour and the consistency you're after, stirring regularly. I have simmered mine virtually all day on a very very low heat, and after 10-12 hours, they are divine. 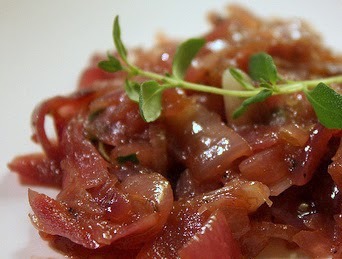 The confit is ready when there is no liquid, and the onion has been reduced to a chunky paste. Spoon into sterilised jars and refrigerate. Gift on it's own, or in a basket with crackers, a sharp cheese and a good port or whisky. Keeps for up to six months. That's if your Valentine doesn't scoff it all this weekend! Mimi, you and Annabel are making me drool with your recipes today. I will have to find out how I can tweak your recipe to make it sugar free. I will ask my friend who has been on the sugar free diet for some time. Is that angel dust my mouse is making when I move it around on your blog by the way? It sounds divine Mimi! I'm so glad you left a footprint at my place so I could find you! Sounds good. Yes, I have four men in my house and they all appreciate the food! Thank you for linking with Home Sweet Home!